Scouring the internet for new straps to feed my addiction has introduced me to a ton of new strap makers located all over the world. From Indonesia to Europe there are amazing strap makers that are feeding a now booming industry. Recently I came across another strap maker that is actually located here in the states and had some interesting and quality looking straps I wanted to get my hands on. I reached out to David of David Lane Designs in New York to set up some straps to review. David was kind enough to send out a couple of his signature pieces for Panerai Central to review. The first custom strap up for review is this beautiful camel French Military leather strap made from suspenders that date back to the 50’s and 60’s. So lets start with how I received this package because the presentation of it was amazing in my books. I opened up the package to find a nice box with a sliding top featuring David’s custom crest burned into to it. Slowly sliding the box open I found the straps neatly wrapped in burlap, which can be seen if you go through the gallery. The packaging did a great job of getting my excitement and anticipation to a very high level. I finally opened up the wrapping to find the custom straps created for me. The color on this strap is a gorgeous camel brown that goes very nicely with almost anything. The strap itself is made out of “BLANK” leather and is semi rigid when you first get it. The actual strap is a two layer design that measures 4mm thick all the way through. The keeper end towards the lugs is a bit thicker at 5mm and then tapers down to the same 4mm which is present on the tail end of the strap. There is one sewn in keeper along with a floating one. The underside of the strap is a very smooth lighter brown that has been stamped with the David Lane crest on the buckle end and a made in the USA logo on the tail side. Taking a look at the side of it you notice a clean finished edge that is not painted. You can actually see the two different leathers on top of each other which give it an interesting contrast. You have the darker edge on top and then the lighter lining on the bottom. It is a detail that is very subtle but gives the custom strap a bit of character. The strap is full stitched with an ecru colored thread that blends nicely with the camel brown strap while still providing enough contrast to stand out from afar. The stitching is done with great precision even though it has been stitched by hand. Taking a close look outside the stitching, you will notice that David has created what I would call a small ridge that gives the strap another dimension of character. For the most part you will find that a strap will be flat, but this little ridge all the way around the strap is a beautiful touch in my opinion. The strap is finished off with a PVD matte black Pre-V buckle which compliments the strap nicely. This is the first strap I have gotten with a black buckle and I think it is very fitting on this color combination. Normally I wouldn’t be fond of a black buckle on a brown strap but since this brown is so light in color, the PVD buckle works nicely. Overall I like this strap a lot. The truth is anyone can make a simple brown strap, but the quality of material and build on this David Lane is definitely worth the price and wait. Keep in mind that David also has a Limited Edition collection that uses rarer leathers, so you can get something that is unique. This particular strap falls in his normal leather collection. Currently David has a lead time of close to 6-8 weeks because each strap is completely hand-made. I know it seems like a long time but when you receive it you will understand why. David is a one man show that does this for the pure passion of strap making. There are so many choices of components that go into his straps that you might become a bit overwhelmed as I did when selecting the combination of materials and finishes. If you find yourself in my shoes, then just head over to his strap gallery where you can get an idea of different setups he has created in the past. 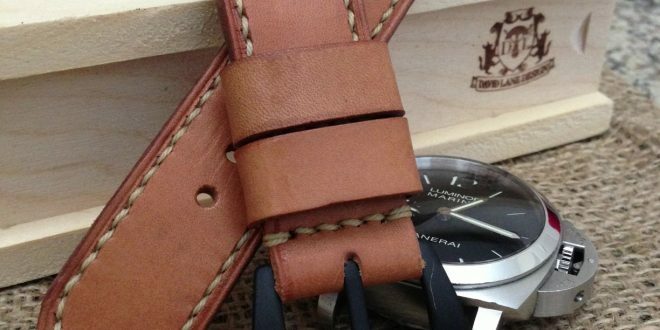 This strap currently will run you $225 USD and comes with a custom-made wood case for it.